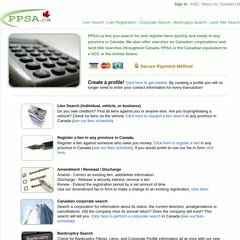 ppsa.ca PPSA.ca - lien searches, lien registrations, corporate searches in .. The estimated 73 daily visitors, each view 2.90 pages on average. toroon63nszp04.srvr.bell.ca, and toroondcnszs04.srvr.bell.ca are its DNS Nameservers. It is hosted by Bell Canada (Ontario, Toronto,) using Apache/2 web server. Its IP Number is 67.69.150.227. PING www. (67.69.150.227) 56(84) bytes of data.